So, here we are again, yet another winter season in Michigan. Wait, well, technically winter does not commence until December 21st. Nevertheless, Michigan weather is never one to strictly adhere to a specific calendar day, so wintry temperatures arrived early this year. Fortuitously, Black Friday generally coincides with the impending falling temperatures, offering a wide variety of cold-weather accessories for the gentleman seeking a bit of warmth. This year, I was able to score a cozy, 100% cashmere beanie, courtesy of J. Crew at an outstanding 50% off the $79.50 retail price. And even at full retail price, the quality is exceptional at that price-point. However, J. Crew seemingly remains in a state of perpetual discounts, so you’ll be hard-pressed to find an item that isn’t on sale. Given my previous experience with their woolen hats, a gentleman simply cannot go wrong when selecting from their inventory. Much like my previous purchase, J. Crew offers a hat that exhibits a comfortable fit without burdensome tightness, great warmth and protection from the elements, and just enough nuanced styling to distinguish it from standard beanies on the market. Currently, the model above is available in dark honey (pictured), navy, and heather oatmeal. And yes, it is on discount, 35% to be exact, courtesy of the code WINTERSALE. Bundle up and happy shopping. Duffle bag. Briefcase. Messenger bag. Backpack. Generally, this assortment of gentlemanly accessories would be categorized under leather goods & travel bags, and they would be dignified with their appropriate name. However, since the public seems to believe that only a woman can own a stylish travel companion, it is necessary to differentiate a bag being carried by a woman versus one being carried by a man. And that is accomplished by simple attaching the word “man” as a prefix to the word “bag“. I don’t know which word I hate more, man-bag or metrosexual, but both are equally ridiculous. So, why am I exploring this topic today? Well, after JR Smith’s monumental mental collapse in the waning seconds of regulation in the NBA Finals (Game 1), the only other topic that has garnered more lattention is Lebron James’ post-game attire – specifically his alligator man-bag (Thom Brown bag, pictured above) that accompanied his ensemble. Gay. Homosexual. Fag. Those are some of the words I read around the Internet used to describe James’ presentation. To be sure, I am not a fan of gentlemanly interpretations of style that go above and beyond to appear effeminate, but upholding the ever-enduring trope of being sartorially masculine can sometimes border on foolishness. In a desperate attempt to eschew the slightest hint of homosexuality, we practice behavior that is downright stupid and has nothing to do with sexuality. Holding an umbrella – what, are you afraid of getting wet from a few raindrops? Wearing a coat – what, a few drops in the temperature have you shivering? Rocking a man-purse – what, you can’t carry your lipstick in your pocket? So, let us have a discussion about the “man-bag”. Selecting one is simply a means of function. Yes, a gentleman needs a carryall to house some of his odds & ends that he cannot carry on his person. Sure, a gentleman may possess less small accessories that require storage than a woman, but he still requires storage nonetheless. Prime example: I purchased a lunch bag from Target to carry, you know, my lunch. Over time that lunch bag has transformed into a storage space for my wallet, checkbook, car keys, cell phone, cell phone charger, eyeglass cleaner, eyeglass cloth, Bayer aspirin, Motrin, various vitamins, hand lotion, lip balm, and whatever else finds its way into the Bermuda Triangle of lunch space. And before you ask – no I am not stuffing my coat pockets with all those items, and I would have no luck in the summer anyway. And no, all those items (varying shape the items being a contributing factor) cannot fit into my briefcase. Therefore, for my lifestyle, I need a bag of some sort to provide refuge for my accessories. Alternatively, I can walk around with low energy, smudged eyeglasses, chapped lips, ashy knuckles, a stiff back, and a headache – because damned if I look gay walking around with a bag to hold all my stuff. But I do – it’s just a lunch bag that does the heavy lifting because I’ve just been too lazy to invest in a smooth, stylish bag. Again, it all depends on lifestyle, but as I have grown older, I find myself carrying those little odds & ends that I choose not to stuff into my outerwear or pants’ pockets – which distorts the shape of the clothing over time anyway. Trust, there is nothing gay about Lebron James. So, man-up and go get a man-bag. Just kidding. Whether it is a medium duffle, messenger, tote, or just a stylish carryall; I believe every gentleman could benefit from owning one. I’ll be sure to post a picture of mine when I scrap together enough coins to do so. Although it won’t be anywhere near the $41K James dropped on his alligator companion. Respect. So, the gentleman’s word on the avenue is polka dot will be a popular pattern in accessories when autumn arrives in a few months. Which is terrific news for me because I started procuring a few polka dot neckties and pocket squares a couple of years ago. Classic patterns, when utilized properly and smartly, will never fade into obscurity. The fact is: Some patterns are simply more popular than others during varying moments in time. Now it is time for polka dots to receive a little shine. 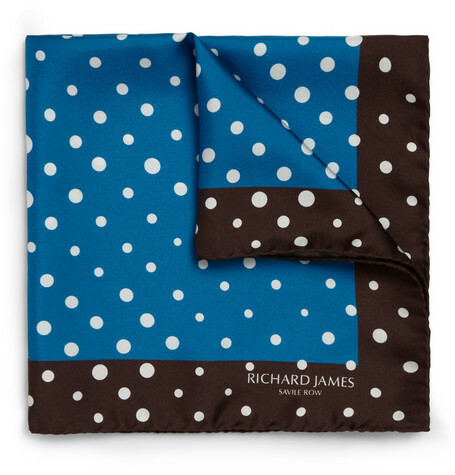 And as coincidence would have it, this chocolate and blue beauty caught my eye over at Mr Porter just yesterday. Sure, some gentlemen may be apprehensive about pairing blue and brown. And sure, the polka dot pattern is a little pronounced here. Nevertheless, this is the kind of visual flair that can elevate an otherwise serious sport coat or suit jacket. If the gentleman is careful in keeping any pattern in his dress shirt, his necktie, or even his jacket in check – there shouldn’t be any reason why you cannot rock this pocket square with reckless elegance. I see this handsome square brashly tucked in the breast pocket of a medium gray suit. Yes – I said gray suit. Topped off with some chocolate oxfords. Killer! I could be totally mistaken here, but I have always held the assumption that slippers are to be worn within the confines of one’s humble abode. However, with greater and greater frequency, I am noticing that slippers have gravitated beyond the walls of the household and onto the concrete walkway. And I am not referring to the casual stroll down the driveway to retrieve the daily newspaper either. 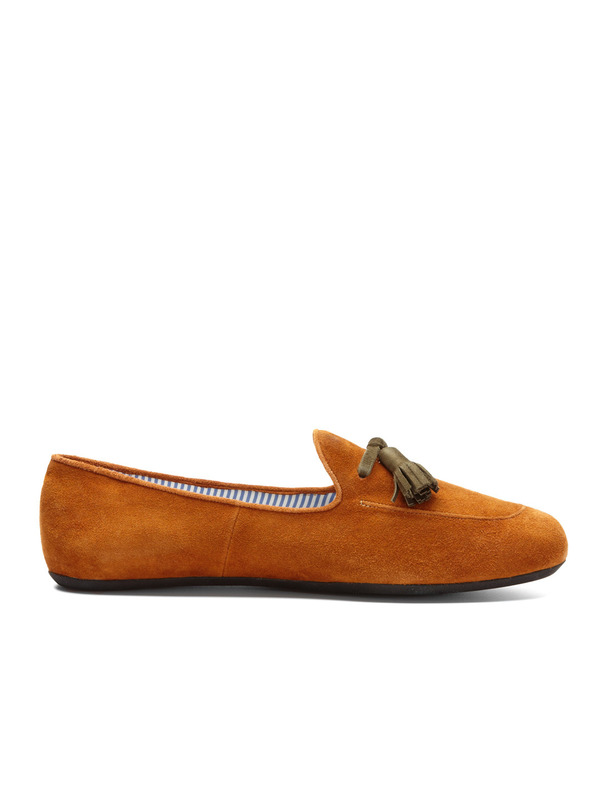 No, gentlemen are rocking slippers as if they are your standard pair of loafers. With denim jeans. With khakis. Even with dress trousers. Now, take the example above, these slippers by Charles Philip Shanghai are definitely a handsome spectacle to beyond, but I am fearful that the construction will not sustain a repeated beating against the hard pavement. Consisting of a suede upper, cotton lining, and rubber sole; perhaps these puppies are meant to be worn around the office on a casual Friday. It just seems like these are designed for a flair of rakish eccentricity and not serious pavement pounding. But again, I could be wrong. Nevertheless, at $175.00, I’m not willing to take a chance.